Milan Williams is a 12 years old girl who has a strong passion for the arts. She has been acting professionally since the age of 5 and can be seen in films, several national commercials/ads for AT&T, Sprout, Nickelodeon, and Unilever-Just For Me. She has performed in many plays, voice-overs projects, live screen play readings and more. She has worked with tennis star Serena Williams, living legend Kene Holiday (Matlock), Lisa Cortes (Executive Producer of the Academy Award® and Sundance winning film, Precious), Damaine Radcliff (Step Up) to name a few. Milan is a recipient of the 2018 Colby Christina’s A Star Has Risen Award, which looks to honor youth that are doing well in school, active in their community while pursuing The Arts. When Milan is not acting, she enjoys fashion designing and sketching. She is working to bring her fashion design to life. Milan also enjoys play writing, photography, science, and spending time with family. 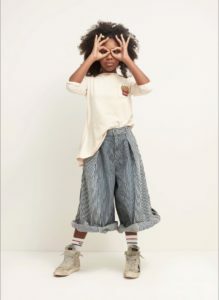 Milan Williams knew she wanted to act and model at the tender age of 5. She has multiple interests and love The Arts!